This entry was posted on Thursday, June 10th, 2010 at 3:04 pm and is filed under Aladdin Sane: 1973. You can follow any responses to this entry through the RSS 2.0 feed. Both comments and pings are currently closed. Perhaps one the albums killer pieces with the band on top form , with powerful backing vocals adding a touch of soul to the power chords , paranoid and unrelenting . The 74 version is superb with it sounding like the highight of the show , a real crowd pleaser by 76 the soloing had turned it into an unstoppable powerhouse. The remake was awful a very poor mannered vocal by Bowie (what was he thinking) and speak spell was yuk Space Oddity far better done. His rerecording seem to lack the original appeal??? “Tania” is one of my favorite songs ever. I even named my cat after it. It’s also how I learned about Patty Hearst. Love this track – my favorite on AS aside from the title track. 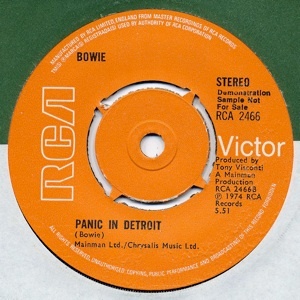 I always thought “Panic in Detroit” was Bowie’s take on “Sympathy for the Devil” (the chaos-witnessing narrator; the backing vocal arrangement; the percussion, etc). And as other parts of Aladdin Sane reflect Bowie’s then-current fascination with the Stones, it would make sense timeline-wise as well. This is one of his best songs, way too low in the poll. 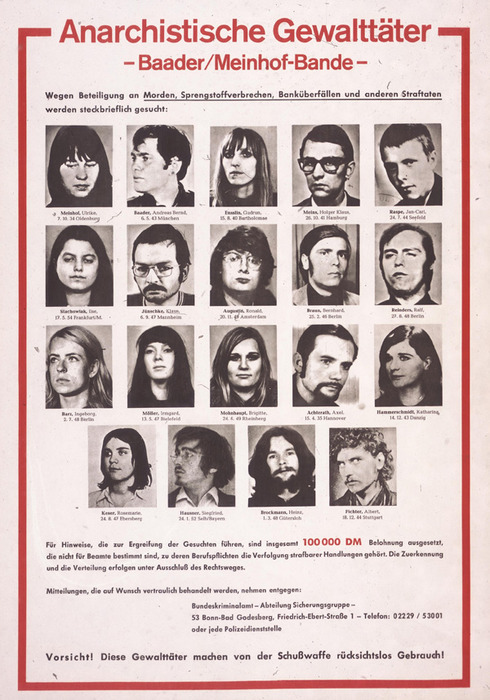 I’m fairly certain the iconic Baader-Meinhof wanted poster is from 1976 if not 77!